DualBootPRO has an easy to use interface that makes it easy for both the novice and advanced user to make changes to the BCD (Boot Configuration Data). Simply put... our program will save you time and make editing your boot menu a lot faster and easier! You can trust in our product because PC Magazine, Microsoft Tech Net, PC World, and dozens of other publications have recommended it to their readers. DualBootPRO has been designed specifically to make manipulation and editing of the Boot Configuration Data (BCD) store easy to use. 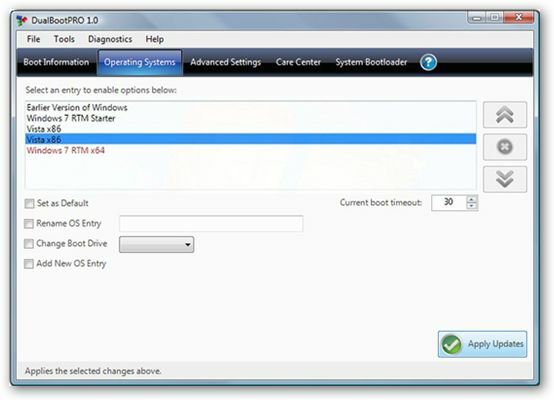 DualBootPRO also includes built-in diagnostics to help find and correct errors in the BCD store, and a number of new utilities and advanced options.